We got our camper back from the shop later this past week and it’s now up for sale. After taking it out last time, I think we are getting a little tired of it. We’ve had it now for three years and we’ve come to the realization that it’s a lot of work. This last time it took forever to pack up and then when we got it home, it took forever to get cleaned up. We decided to go ahead and sell the camper and then with that money buy into the Disney Vacation Club. We’ll miss the camper. We had a lot of fun with it over the past few years. 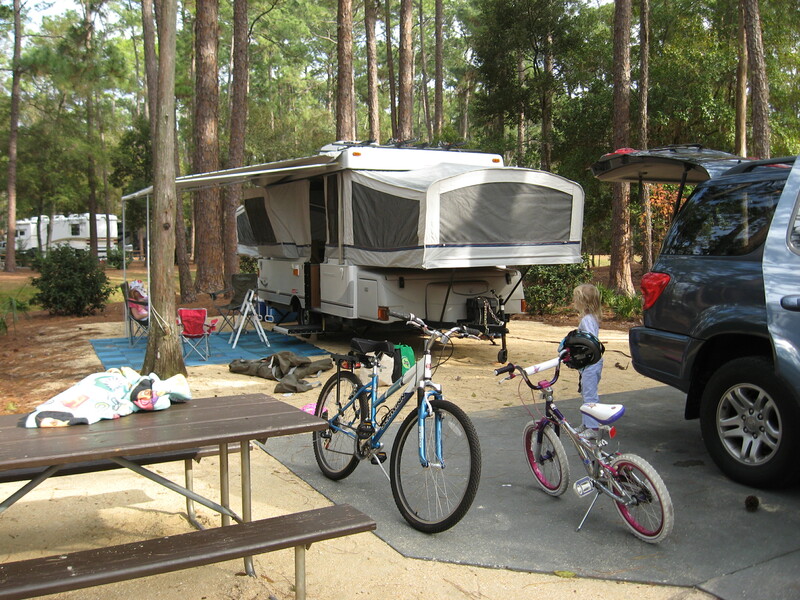 Some real great memories of camping at a few state parks and down at Disney. Jennifer has been the “cookie mom” for Emily’s troop this year. And once again, we are are overrun with Girl Scout cookies. This weekend was the last set of cookie booths. Abby and Jennifer stood outside The Townhouse Restaurant in “downtown” Oviedo on this past rainy, cold Saturday morning. They sold well, but it turns out we have several cases of extra cookies, so if you are interested, let me know and we’ll send you some. We need to get them out of here before Austin eats them all.